I found this paper piecing probject and it's caught my attention. This blogger has invited people from all over the world to join her in making one 3" block per day over 365 days plus the 366th block a bit larger for Leap Year (2012 is a leap year). Each 3" block will be a little house made from scraps. You decide how you would like to make your blocks and the timeframe in making them, it's all up to you! Please post your progress and if possible, share a picture....we love seeing pictures at QATW!!! House3inchPP4per.pdf (18kb) downloaded 18 time(s). HousePP6inch.pdf (14kb) downloaded 16 time(s). Julie... I've never paperpieced before and I'm going to give this one a try anyway....join me! I bookmarked it. I have a few goals this year, this could go under the stashbusting goal. Yay! It looks like there are a few of us interested in taking on this daily challenge throughout 2012! I have never paperpieced before and I made a sample block last night with brainpower and just thinking it through. I think it turned out useable...lol. These are tiny pieces and make adorable tiny blocks! I'm going to search online for pp techniques to see if I can get some tips. If any of you know of some good sources or want to share your techniques, please do....thanks!! I might make these - I'd like to do them in 6" PP blocks. I like the sample quilt. What a great scrap busting quilt! Count me in. I'd prefer to work with the 6" houses (either PP or RC). Those 3-inchers are intimidating to me, but would work for a dog house or two. I'll start this sew-along once I finish 2 UFOs in 2012. Yay! More stashbusting! Thank you GG, for re-working the house pattern. Okay, yes I am doing this and I am going to do the 3" size. I am starting now. If for some reason I don't get any made before the first, I will let you know and change it to starting after 2 finishes. I believe I'll be doing the pp method, but will know better once I make a few. Thanks for the tips! I definitely will be doing paper piecing. Okay, I'm actually starting some houses NOW. I decided to make some to go as a border for a quilt top I'd like to finish SOON. I'm new to paper piecing too. I was going to make 3" houses but I've changed my mind and I'll make 4" houses over the year. 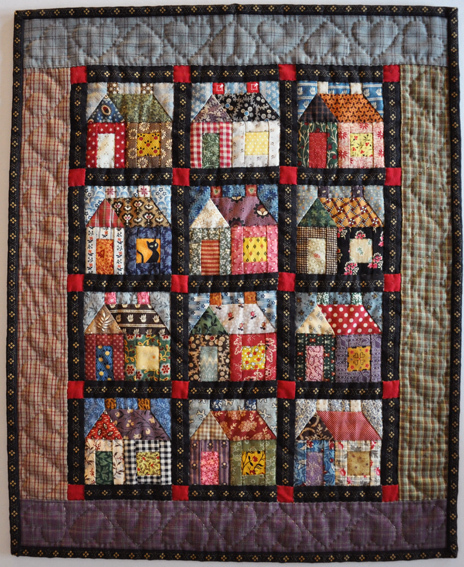 I do plan on making 366 of these houses and I'll fill the quilt top with houses and then use the remainder of the houses on the backside; with 366 houses, I can still label it my 2012 Leap Year Quilt. Oh Stephanie, that's so cute! Thank you for sharing a picture!! Stephanie, I think it might help to add 2-3 stitches at the start and at the end of each stitched seam to help you avoid your seams coming apart. I hope that made sense. As for using directional fabric and getting it to lay straight, I'm with you on working with it until it looks like it's going to come out straight. The only solution I see for this situation it to try to twist my brain from left brain to right brain and visa versa. LOL, just kidding! However, it really is a brain teaser for me but I'm going to win as I build my houses....one hour at a time. I'm liking the new challenge and my hope is that in time, I will learn so much about paper piecing that soon I'll be building my houses in 15 minutes flat! Hi House Builders! Just think, no hammer and nails, just your sewing machine and fabric..... how perfect is that for building houses!! I'm still definitely in the learning curve of building my houses and although I've completed 4 of them, each took me over an hour to make. In looking at the positive side of my time spent building each house, I am teaching my "Abby Normal" brain how to paperpiece! I encourage you to keep building and keep learning this technique if it's new to you! You can do it!! These are so adorable! I'm going to have to join in on this at some point, after a couple of finishes I suppose. I know I will do PP, but not sure yet if I will do 4" or 5". I just love these, and have lots of plans! May have to play around with one, then will commit to a size. Hi Pam, your houses are beautiful!! Pam those are beautiful. I'm with you, very hard for me to do really scrappy.